Do your walls need refreshing, or do you have an irregular or unsteady surface to fix? Sometimes, a lick of paint just won’t cut it. Plastering is an easy way to resolve wall surface problems – however the fuss of finding a professional plasterer can be a real off-put to some. Tip 1 – Prep, prep, prep! Start with the preparation of your chosen surface. Don’t underestimate this stage – if you aim for a perfect finish, be aware that plaster will not stick to wallpaper or dusty, damp walls. This is where preparation comes in – and it’s simple. And treat the surface with a three to one part PVA glue and water mixture, which acts a wall ‘primer’. The wall primer is vital – without it, any surface with high suction or thirst will immediately drain a layer of plaster of its moisture before its set. This weakens the plaster – and could lead to it falling away. Last prepping tip – The PVA and water mixture must be applied to your surface before the plastering begins, and you must plaster while the coating is wet. Touch the surface to test. If it feels tacky – but not too wet – you’re on the right track! This tackiness ensures that the plaster will stick – and hopefully remain on your surface. Tip 2 – Get the recipe right. For the perfect mix, here are some rules to follow. To begin, plaster and water mix at a ratio of around 50:50. Remember; add plaster to water – NOT water to plaster. Begin by pouring the plaster into the water so it mounds above the water, and mix only this to create a lump free solution. Incorporate handfuls of the mix from then on, continuing to stir. 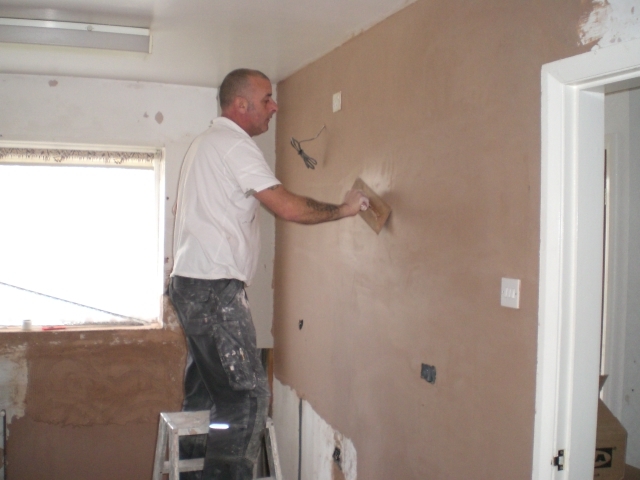 Test out the plaster – does it sit on the trowel without sliding off? It’s ready if this is so. To be extra sure, stand a stick in the plaster mix – if it stands upright, you’re ready to go! Tip 3 – Take it easy. Timing is everything when it comes to plastering – the perfect finish is achieved through performing all six stages of plastering quickly and efficiently. This is why a small surface to begin on is recommended. Try not to begin covering something that will take you longer than 30 minutes. More importantly, don’t waste your time by trying to achieve a perfect finish on the first layer alone – this can be improved later after numerous drying stages. Don’t over complicate and make plastering more painful and difficult for yourself; be quick. Tip 4 – Clean as you go. Plaster is something that cannot be contaminated – for fear it will set too quickly or go off before you use it. As previously stated, the perfect finish is achieved through good timing – so use your time wisely by cleaning buckets and instruments while waiting for the layers plaster to dry. Keep a watch out for any old bits of dried plaster. If they sneak in and get mixed with any fresh plaster, they will cause pulls and drags – less than ideal if you seek a perfect finish! Is the water you use clean enough to drink? Is your bucket clean enough to drink out of? Are your instruments clean enough to eat from? If you answer no to any of the previous, know that your cleaning needs to improve before a perfect surface can be obtained. Tip 5 – Over-polishing is a bad idea. Yes, a perfect finish is what you want to achieve. But a perfect finish does not mean as smooth as glass. A wall or surface that is as smooth as glass will cause any paint or wallpaper that you apply to peel off in some areas, while staying put as hard as a rock in others. Not the look you were going for, I can imagine! This will totally ruin your plaster finish – imagine that; hard work and efforts wasted. Think of an eggshell, and its texture. This is how your finished surface must feel. With these tips in mind, you will be on your way to having a perfect, even finish that is ready for a coat of paint or wallpaper – without hiring a professional plasterer!